Excellent gift for any bird or nature or lover, or just garden decor. A dream home for any feathered family. Door on back for cleaning purpose. 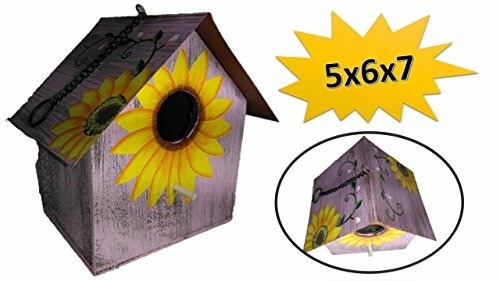 These Birdhouses are best suited for a variety of wrens and finches who are comfortable in a freely swinging nest box. These birdhouses have all of the creature comforts for the birding enthusiast. Ventilation, drainage, an unpainted interior and a removable back wall for easy cleaning as well as a 1 1/4 inch opening. ★ FUN - Adds fun and cheer to any garden decor, Display in your garden or on your Spring patio. ★ GIFTS - Excellent gift for any bird or nature or lover, or just garden decor. ★ COMFY - These birdhouses have all of the creature comforts for the birding enthusiast. Ventilation, drainage, an unpainted interior and a removable back wall for easy cleaning as well as a 1 1/4 inch opening. If you have any questions about this product by TopNotch Outlet, contact us by completing and submitting the form below. If you are looking for a specif part number, please include it with your message.